There were no medals for the Irish team on the opening day of action in Poland but they more than held their own at the UCI World Cup. And there are medal chances to come. There were no medals for the Irish team on the opening day of the UCI World Cup in Poland, but the Irish have still held their own. 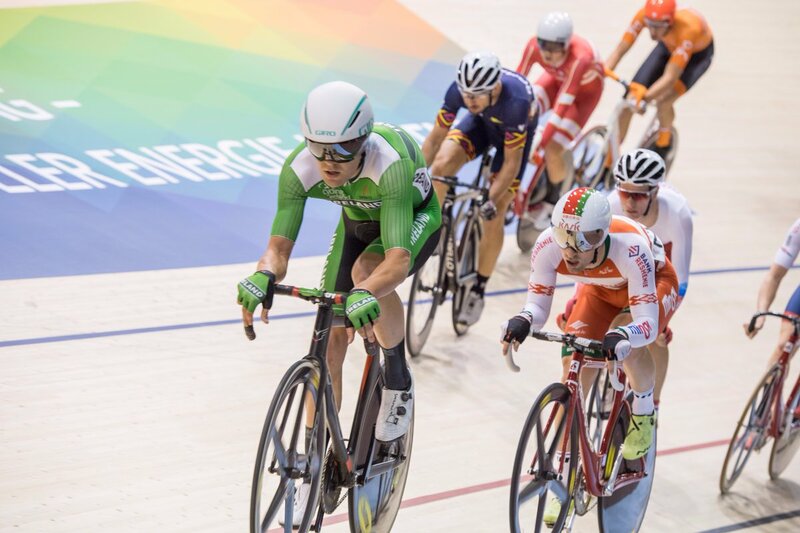 Mark Downey’s 8th place in the points race was Ireland’s best result. However, Marc Potts is also through to the final of the scratch race. Having claimed 4th in the event at the recent European Championships, Potts was 2nd in his race today to qualify for the final. And that consistency serves as an indication that a big result at this level is hopefully just around the corner for the national criterium champion. Before his final in the points race today, Downey finished 2nd in his heat to qualify. Lydia Gurley finished 14th in her points race and was 20th in the scratch race a little later in the day. 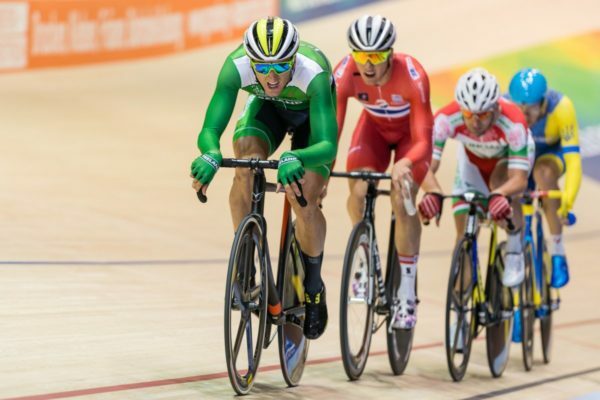 Having taken a run of medals, up to and including gold, at World Cup level earlier this year; there is inevitable major expectation around Downey every time he races. And while he didn’t medal today, he was far from downbeat. “I went for my normal tactic of waiting until a key part of the race, and then going it on my own,” he said. Nikita Panassenko of Kazakhstan was the only rider to lap the field in Downey’s race and won gold. Greece’s Christos Volikakis, who was fifth in the recent European Championships, took the silver, with Liam Bertazzo from Italy winning bronze. Downey will get his chance again tomorrow, going in the madison with Felix English. And he is bullish about their chances. “I’m very excited for the madison, as it will be more based on strength,” he said. For her part, Gurley’s very presence in the team in Poland is impressive, coming as it does after a bad crash at the London Six Day just last week. Still nursing a tender leg, she had the added challenge of riding the final of the points and scratch races just 40 minutes apart today. “Considering that I spent last Saturday night in a London hospital thinking I broke my leg, I’m happy to be here giving it a go,” she said. “I crashed in the tempo race, and the pedal went into my leg. I still have some pain and swelling, but it’s time now to rest up and get ready for Sunday. In her points race, Belgium’s Lotte Kopecky, Ganna Solovei from Ukraine and France’s Coralie Demay lapped the field and took the podium places in that order. Tomorrow will see Robyn Stewart compete in the sprint. Lydia Boylan goes in the omnium, and the aforementioned Downey and English step out in their madison. Potts goes in his scratch race final. 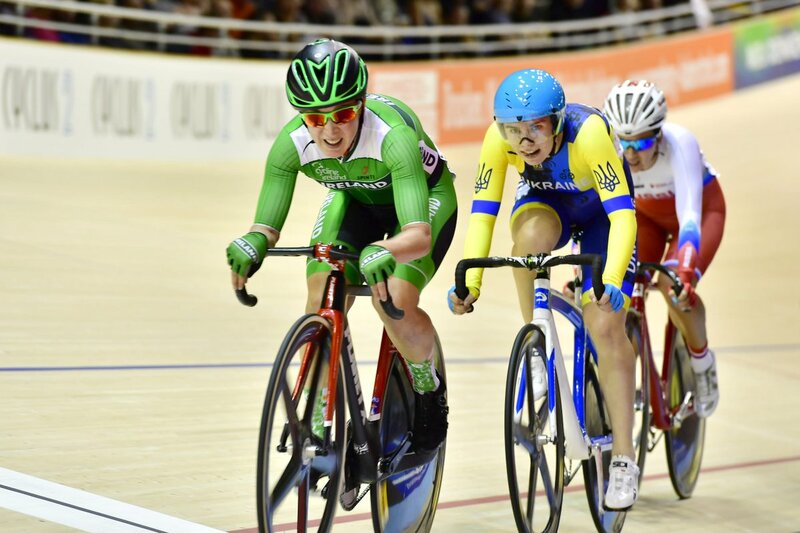 On Sunday English tackles the omnium while Shannon McCurley is back in the green of Ireland in the keirin. And after their Europeans silver; Boylan and Gurley are in madison action again.